Amazing how writing a blog helps to clarify the understanding of these Listener crosswords. N E W S – I’ve just understood the title. It was clearly not going to be a crossword about the Treasurer’s latest austerity measures or the exploding Qantas plane, so I had shelved that word for later. Of course, now it makes sense! North, East, South and West! Initially we took a very deep breath when we saw that we had our beloved jumbles AND misprints. Short of its being a numerical with jumbles and misprints, this is just about our worst nightmare. However, solving went on at a cracking pace with some lovely moments. We had slotted in VITRIFACTION without much checking or thought and that caused some troubles. (It is amazing how one false solution can delay progress and cause trouble!) Finding KICKER put us right there (Panto lacking start of narrative loses us – an unfortunate turn of events in Tinseltown – Knickers, losing its N and S!) So we had VITRIFACTURE. We are used to finding the correct letters from definitions, but these subtle ones hidden in elements of the word-play were a challenge – for example, the need to know that A can stand for AREA but not ARIA in Chambers (Singer furious after aria – alto recalled average tenor). That, of course, gave us our E corrected misprint in a question that was speedily appearing. Again, ‘Look easy after accepted drug’ (A + LO + E) gave us the T misprint correction (EAST for EASY). The most subtle of these had to be AD REFERENDUM (Notice about Scots sound abuse now returning is to be considered again). We painstakingly broke this down to AD + RE + FERE (Scots sound) N (nOw becoming nEw and giving us our E corrected misprint) then DUM (abuse = mud returning). Wow! P-CELTIC was probably the greatest challenge. No cheaty tricks with word-finding on-line versions of the Chambers completed that light. However, we soon had our question: “Can you name the most N,E, S and W states of the USA?” – (though, at first we had ‘States of TNEUSA, as nuclei could be nubs, as well as hubs. It was a typical numpty diversion – we were wondering which African country had renamed itself TNEUSA). Well, yes, we can answer that old chestnut of a question. We’ve visited the most northern, eastern, southern and western states of the USA and were frequently told that we were doing so. 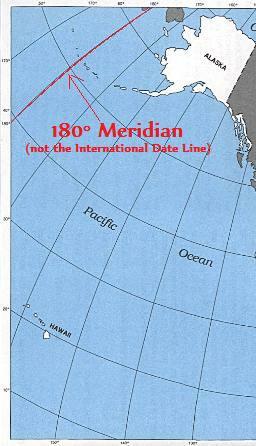 It remained to find ALASKA and HAWAII in the grid. There was a moment of panic then, as I couldn’t see how we were going to decide which of our leftover letters was going into each of the unchecked lights, when we had used the SKA of ICEPACKS to put Alaska furthest north, east and west. But wasn’t Stan a subtle genius? When we had used the I for IN THAT, the P for PAEAN and the E for ENCHAFE, there were only two Cs left. HAWAII gave us even less of a problem as DEAN and DERMIS left only the C of CHAINSAW to slot in, and NUCLEI, ASTIR and DEMOTIST had already used three of the letters of AIRT. Great fun this. Thank you Stan! To my knowledge, Stan has only had one previous Listener. That was 4046, Disagreement in August last year where the subject was the number 1729 and the disagreement between GH Hardy and Srinivasa Ramanujan about how interesting a number it was. This week, time for a news quiz with a few jumbled entries and a misprint in each clue, not necessarily in the definition. The first sweep through claimed about a dozen answers. These included the excellent clue to MADONNA (Virgil’s enthusiastic about new introduction to Aeneid), although Virgin was a fairly easy misprint to spot, plus LAZOS and DIOPTRE in the NW corner, and DREICH (Dire bumbling about bard is tedious in Burns country), DERMIS and ELIJAH in the bottom left. I also had ANVIL, IN THAT and ALSO in the top right, so a nice smattering of entries all over (although some may need jumbling). However, the clue to ANVIL (Block in the near village) seemed to have a misprint that wasn’t a word, nean. Not that this was necessarily a huge obstacle, but it didn’t appeal to me. All in all I found this a fairly straightforward (and enjoyable) solve, with entries slotting in at regular intervals. ICEPACKS, CHAINSAW and AIRT were obvious jumbles, as most probably was AL.M at 1ac. I finally resolved 1ac which was ALAM, being a jumble of ALMA [A (from) + MAL (sickness) with the L promoted to second place; it was the meaning of the initial A that I missed for so long]. At last I realised that the misprint in 12ac ANVIL was year (Block in the year village, and not needing to make sense, but at least containing real words). Lastly I had to find one letter in each column which would highlight the theme. I don’t know whether Stan made this final step deliberately easy, but having H, W, A and I staring at us there in the bottom row was a bit obvious, but then with all the information gathered it wouldn’t have been a much more difficult task if the H or W had been unchecked. And in the top row we had ALA on the left and SKA on the right. I thought this was a really neat puzzle from Stan, and how considerate of the yanks to have the two states both containing six letters. The clues were very sound and, for the most part had good surface readings; my favourite was probably 31ac MAJORLY: With blockage receding, French drove in an extreme manner with drove being a misprinted drome (Orly). And for your information, Obama was born in Hawaii but became a senator for Illinois, whereas Palin was born in Idaho and became governor of Alaska … and future presidential nomination, candidate, President?!!!! Finally, can you name the 8 states beginning with the letter N?! I have set 15 by 15 puzzles as Brock for a good number of years, on a few occasions for the chapel magazine at my college about 20 years ago, and more recently from time to time for our village magazine (Yarnton). It was in that context that the inspiration for this puzzle originated. While driving and walking past fields in our village that have been allocated for a number of years for redevelopment, being just outside the green belt, it occurred to me that a puzzle based on HORSES (the inhabitants of the fields at the time) and HOUSES (the proposed inhabitants) would be a neat idea. The subject was quite controversial within the village, with the pristine fields earmarked for an estate which would swell the village population by over 10%. So my original idea was to have two conventional cryptic crosswords with the same grid, the one solution differing by one letter resolving which grid the other entries were to go in. I intended to set this for the village magazine. These Empty Fields puzzles were partly gridded up in January 2006, but never saw the light of day, since I decided the concept was a little too hard for the readership. Not bad for a 10-minute walk, I think you’ll agree! One issue was how to handle clashes in a left and right puzzle. The extra ambiguity would probably make it too hard for the solver. Hence I decided that the clashing letters should match each side, making the initial grid fill easier, but inevitably leading to a controversial ‘two-part’ puzzle. Another difficulty was coming up with a grid-fill that had sufficient average word length and was not effectively split into two vertically as well as horizontally. But within a week I had almost got the final grid (grid scheme 4), and was considering whether to do something with the letters ‘discarded’ from the clashes. In the end I decided against that. I was surprised to discover that STABLE BLOCKS was not in Chambers. For a while this led me to look at alternative possibilities (e.g. using BREEZE BLOCKS, with breeze3 in Chambers providing the thematic link to horses), saved as grid scheme 5. In my view this severely weakened the thematic idea, though, so after wasting some time seeking alternative grid fills I returned to the original and finished the grid fill using ELDEST and ECOLOGIC, which I called grid fill 4a. A few people have expressed disappointment about the “one exception” to the clashes (C/T for ECOLOGIC/SYLLABIC and BEDSIT/ELDEST. 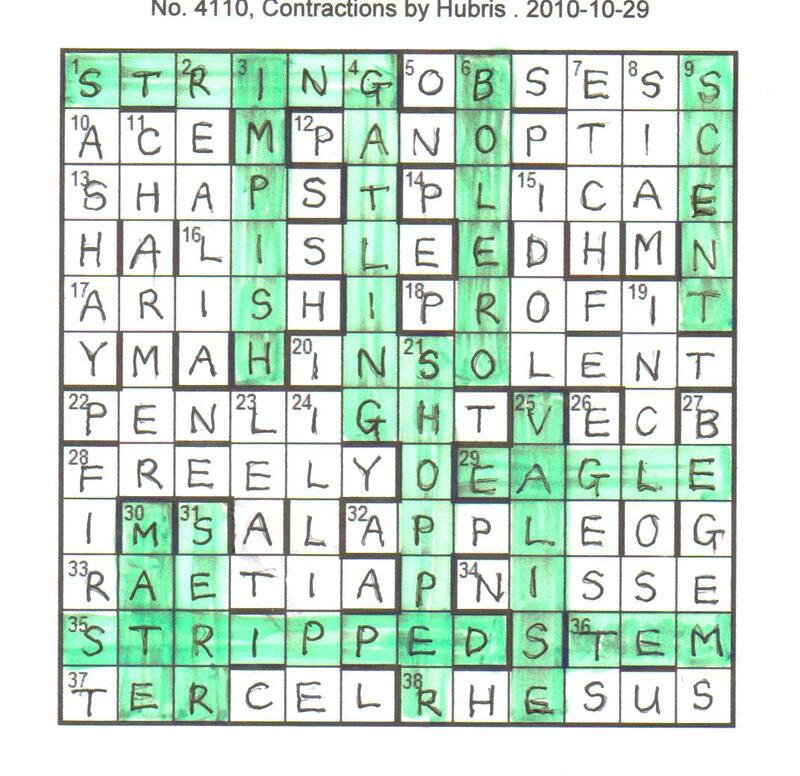 I did try to find a grid fill which allowed for this to follow the same rules, but it quickly became obvious that the need for the B and G to be unchecked restricted my options to the point where I could not find a grid fill that did not effectively split the puzzle across the middle horizontally. If I had thrown away the idea of BEDSIT, I might have been able to do something with the B and G positioned differently in the grid, but finding suitable words with a reasonable number of the relevant letters from the phrases was a challenge in itself. So I stuck with BEDSIT/ELDEST, which also allowed me to keep the thematic ECOLOGIC (green field side) and TESSERAE (under BLOCKS). I also tried to find other possibilities which avoided the use of PFUI, which is only in Chambers in the etymologies of related words. Once I’d faced up to the fact I would have to use it, I deliberately paired it with ECHT, considering that I might write a clue in German! One additional feature was including my initials, which is something I intend to try to do with every barred puzzle I set. As I mentioned above, this was a period of intense activity for me in terms of setting ideas. After less than 3 weeks, I put this puzzle down and started on several other ideas. One of these others formed my debut submission to The Listener in September 2008, but after over 18 months of waiting, it was rejected. It was not until January 2009 that I picked NABAWD up again to work on the clues. January 2009 was another fairly intense time for other interesting puzzle ideas, but with the village building plans progressing fast at this time I wanted to get this puzzle moving as well. So I sat down to work on the clues, one or two each available evening, until in March I was able to send a draft puzzle to my two test solvers. As the summer started, it was time to act on my test solvers comments. The fact that the building work for the new estate had started meant that the constant noise of trees being pulled down, ground dug up, etc acted as an incessant nag for me to finally complete and submit puzzle. Double clues like this are not easy, and my respect for setters using this device increased a lot during this whole period! To me, the clues are the single most important part of any crossword puzzle, and so I took care to make the surface readings reasonable, with an interesting mix of different clue devices. In addition, for the left/right puzzle type I had been advised that one of the keys is to hide the division between the two halves, so (with a few exceptions) I made this a priority. One of the exceptions was PFUI/ECHT, which I wanted to make easy because PFUI is not a head word in Chambers. For a few of the pairs, disguising the divisions was easy – e.g. for LESS/FUSS, “not so much trouble” jumps out. Two other specific things I would like to mention about the clues. One concerns 1A “Rip up stalks and cobble where animals used to be kept” for STABLE BLOCKS. This was a very emotive clue, summarising the whole motivation and inspiration behind the puzzle. 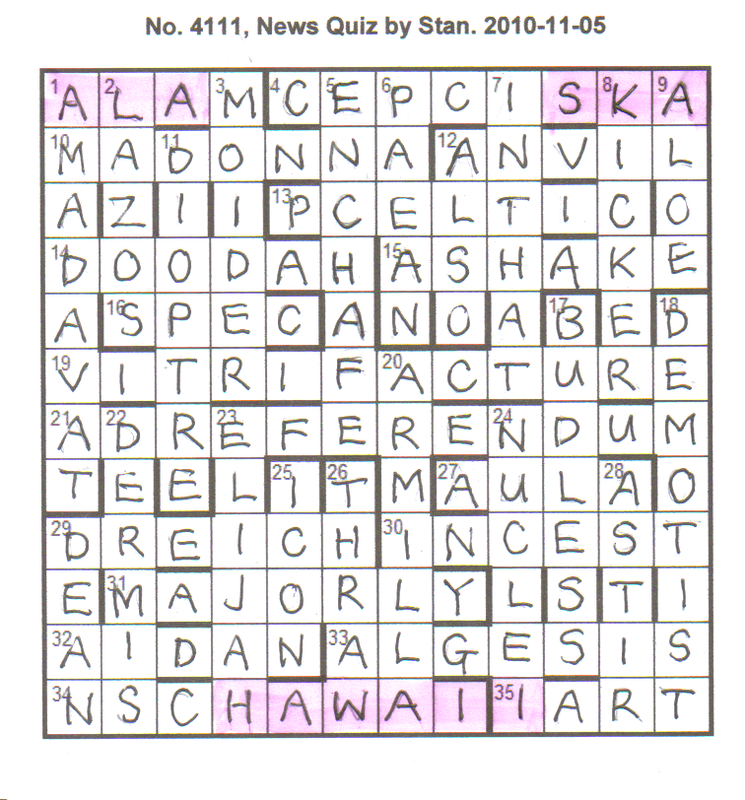 Following the advice in Don Manley’s Crossword Manual, I wanted a very simple clue, and I liked the idea that Phi used in his late 2007 Listener puzzle Disappearance relating the clue to the theme. The other is that I deliberately included colour pairs in some of the clues. The relevant colours were silver/greenish-blue (9A, HAG/EEN), scarlet-red/black (19A, CLEATS/ANANAS) and green/orange (5D, ECOLOGIC). This was a subtle, I suspect too subtle, additional hint to what was needed, although I guess if too much were read into it, it would serve as a red herring. Thank you to those who expressed appreciation for the puzzle; sorry to those who found it less than satisfactory. Maybe it was appropriate, given the theme, that it polarised views, but it was my intention to amuse rather than abuse solvers. If you had trouble with the puzzle, please just spare a thought for my long-suffering test solvers, who had to struggle with a far less directive preamble! That short note before the preamble, ‘Hubris (John McGlashan) sadly passed away in August. This is his sixth and final Listener crossword.’ was a sad opening to our Friday challenge. We have only solved one other of Hubris’ crosswords, last year’s puzzle that gave us the House of Commons. We thoroughly enjoyed that one, so we enthusiastically got going on this one. The title was a giveaway and the second clue we solved showed us where we were going. 30d. ‘Power to act on behalf of another ship’s officer (4)’. After toying with ATTORNEY and MATE, which didn’t seem to have much to do with each other, we hit on MANDATE (M and ATE) and MATE. We were on familiar ground. Last week’s difficult Crossword Club offering used the same theme. SC (and) ENT – SCANDENT giving SCENT (that one taught us a new word – we had to work backwards to find that SCANDENT meant climbing and we wondered about the ‘paper’ trail. I suppose the ‘paper’ was included to make the clue a less obvious suspect). What a fine, flawless and gentle puzzle for Hubris’ final one. 4040: In Shock, based on “the best club in London” … the House of Commons! In Contractions, with twelve clues containing two definitions to be resolved, it didn’t take me too long to get 36ac TEM and TANDEM. This was a 3-letter entry, so the AND was to be used as a joiner and thus omitted. Soon after came B[AND]OLERO, SC[AND]ENT and STR[AND]ING. Luckily I got IMPISH from crossing letters reasonably quickly, and it was clear that other linking words were involved, the other definition here leading to IMPOVERISH. There turned out to be 7 ANDs, 4 INs and 1 OVER to be discarded. P[IN]STRIPED and R[IN]SER took me a bit of time to confirm. I was a bit perplexed as to why it was necessary to highlight the affected words; guesswork alone would have probably resulted in an incorrect solution with many of the words having valid alternatives. As a result, I spent a bit longer than usual checking my solution to try and make sure that there were no red herrings lurking in the grid. I found none, but it was a reminder not to take anything for granted in a Listener. All in all an enjoyable closing puzzle from Hubris, and a great shame that his setting career was so short.